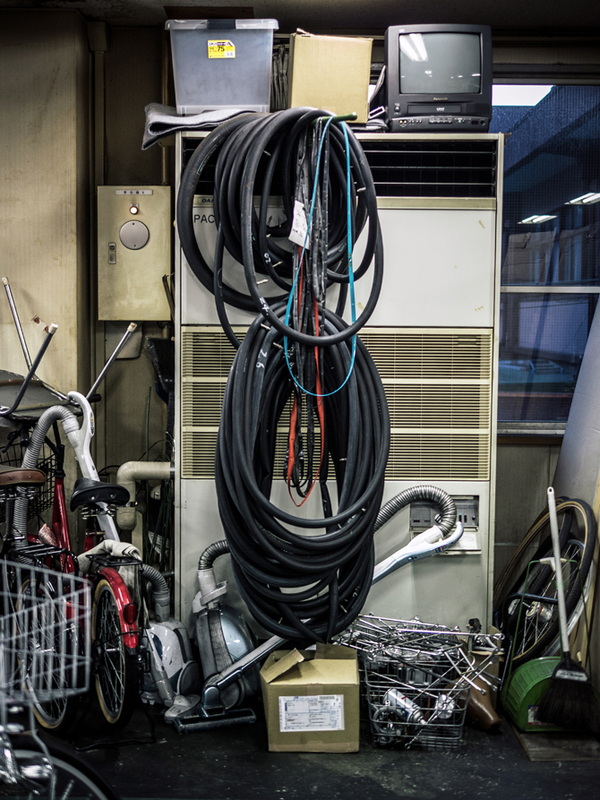 If you lock your bike in the wrong place for too long in any Japanese city you’re probably going to get a ticket slapped on it informing you that it will be removed at a later date. For the unfortunate, once they’re taken any unclaimed bicycles will only be kept for a limited time before being recycled or worse, destroyed. About 85% of Japanese own bikes so there’s a lot of them around and a constant supply for the bike police. 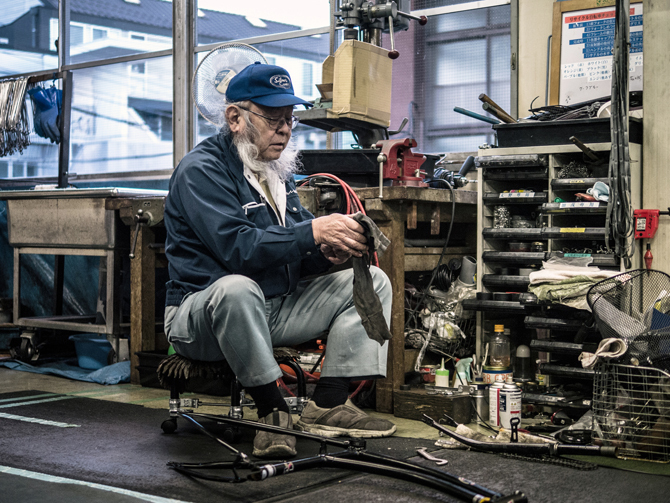 I’d heard about Japan’s bicycle recycling program through a friend who knew I was looking for a less precious daily alternative to my road bike. In Tokyo these places are specific to the area of the city that you live in, ours is an un-signposted, unglamorous grey council building that feels like an abandoned school. 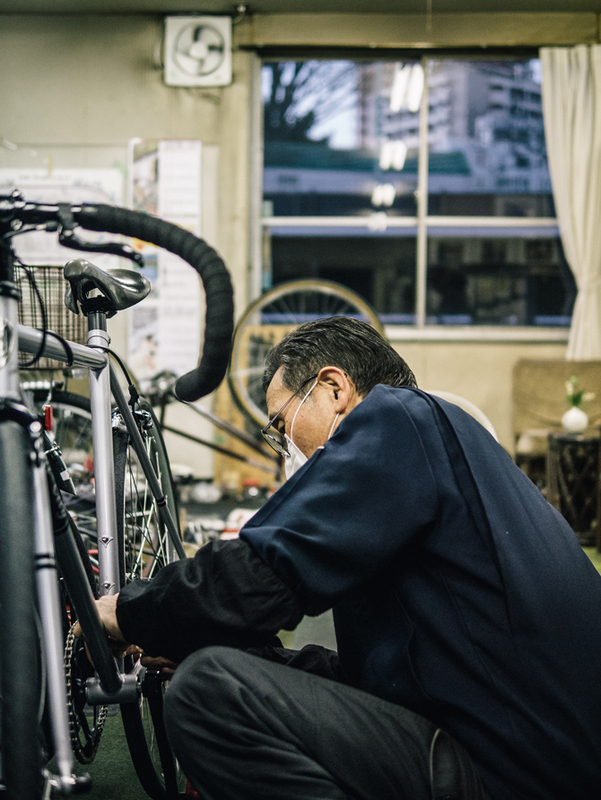 The Minato-ku Bicycle Recycling Department is made up of a team of three bike lovers, all part of the cities Silver Human Resources, an organisation made up of retirees who love what they do and want to continue sharing their knowledge and experience, whether its with bikes or anything else. 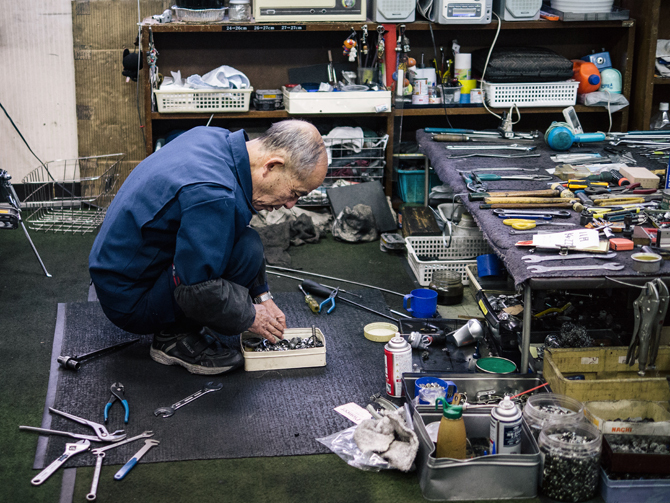 This team is led by Tomita-san who began the project by himself fifteen years ago–to date they’ve recycled over 4,000 bikes that would have otherwise been destroyed. 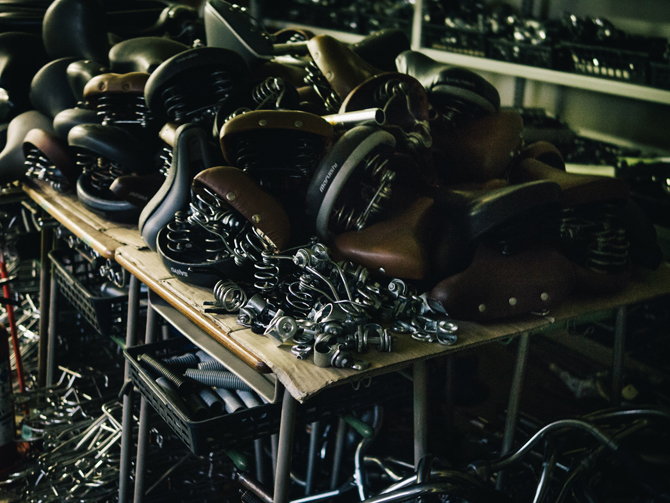 In the workshop, they’re surrounded by the most amazing stacks of replacement parts spanning two rooms: there’s a table overflowing with saddles, underneath it seat posts, a corner with rows of wheels, brake cables hanging in bunches from the ceiling waiting to be reanimated. 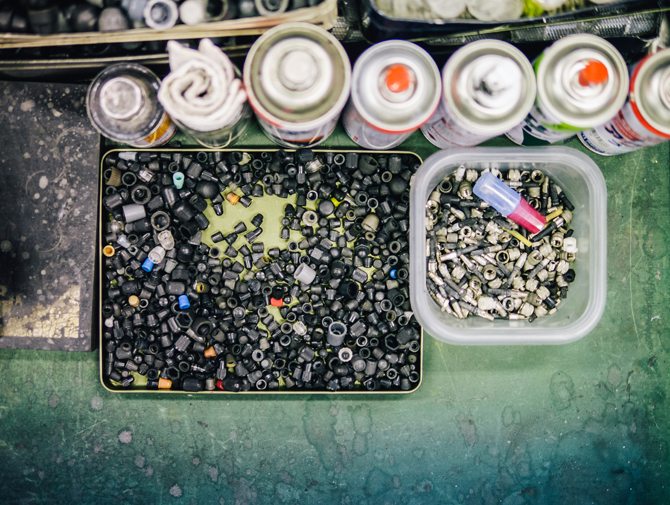 The place itself is very organized as are most things in a country where space comes at a premium, the tools are neatly arranged next to a selection of tubs filled with valve caps, cable adjusters, and other small salvaged parts most wouldn’t think twice about keeping. 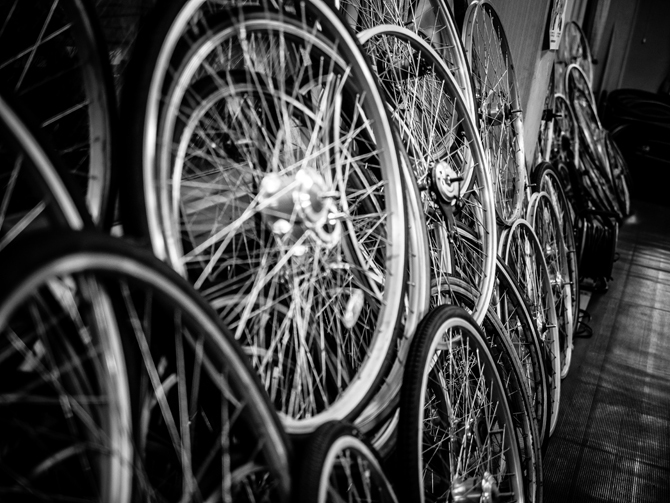 They sort through the confiscated bikes available to them, making a limited selection of a hundred or so that will be sold on the second Sunday of each month, dialing them in using parts from other re-claimed bikes. Here everything is recycled, they take pride in the fact that they are self sufficient and never have to buy anything new. Tomita-san took me through the process where they completely strip the bike, replacing broken or damaged parts, often respraying individual pieces in a makeshift multipurpose booth (made from an old bicycle basket, wheels, mudguards a chain and various other bits and pieces) mixing paint to match the original color and finally reassembling it as if it were new. 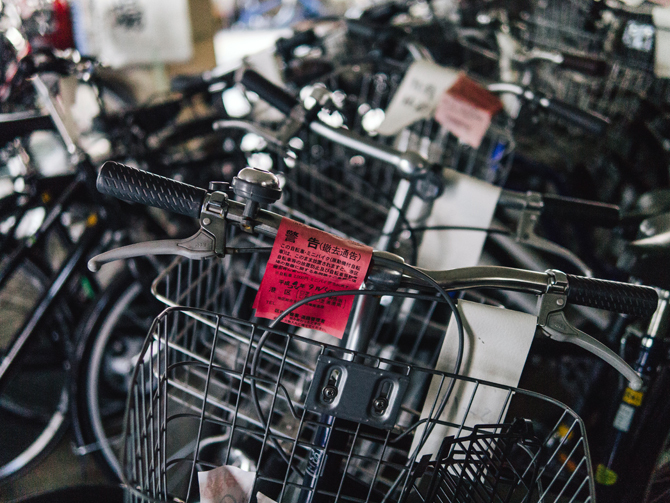 Prices range from ¥7,400 to ¥8,900 for standard mama-chari bikes which form the bulk of what they recycle, the workhorse of daily life here whether its carrying heavy shopping or balancing up to three children to and from school. Everything else is deemed non-standard (road, suspension, folding) which they usually select a handful of and auction them in a game of Jan-ken-pon (rock, paper scissors) for roughly the same price, but with these there’s no guarantee if anything goes wrong. If you’re fortunate enough to go there at the right time, in theory you could get a very expensive road bike for next to nothing. In my hunt for a daily bike I spotted a very nice, almost new track bike they were going to strip for parts, exactly what I needed for getting around on and realistically the only bike there I had any interest in. It had a fixed gear and therefore illegal to use on the roads, so they couldn’t sell it in the auction. I knew it was a simple job to convert and tried to persuade them to sell it to me. Initially they refused–they’re a government supported organisation and could get shut down for selling a bike like that if there was ever an accident (bikes here have an ID number tying them to a registered owner)–but I was persistent and went back a couple of times to chat and prove that I was serious and loved bikes as much as they did. 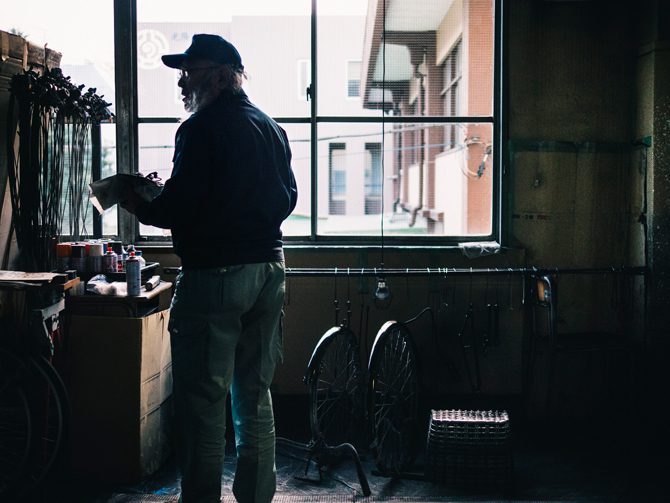 It took time and patience but eventually after making the relevant calls they agreed to trust me and let me have the bike: no guarantees, no stripping and rebuilding, it was all down to me with this one. I wouldn’t have it any other way though, there’s a rare pleasure in building a bike yourself, something I’ve enjoyed since I was very young. I think they sensed that which is maybe why they invited me back again anytime I needed spare parts or advice. Lee Basford is a graphic designer, artist, and photographer working in and around the overlap of art and design, blending these disciplines to create work for arts, film, fashion, video games, and music companies that include Sony, UNIQLO, Nike, Rapha, Capcom, Sega, EMI, Parlophone, Saatchi, and Artificial Eye.